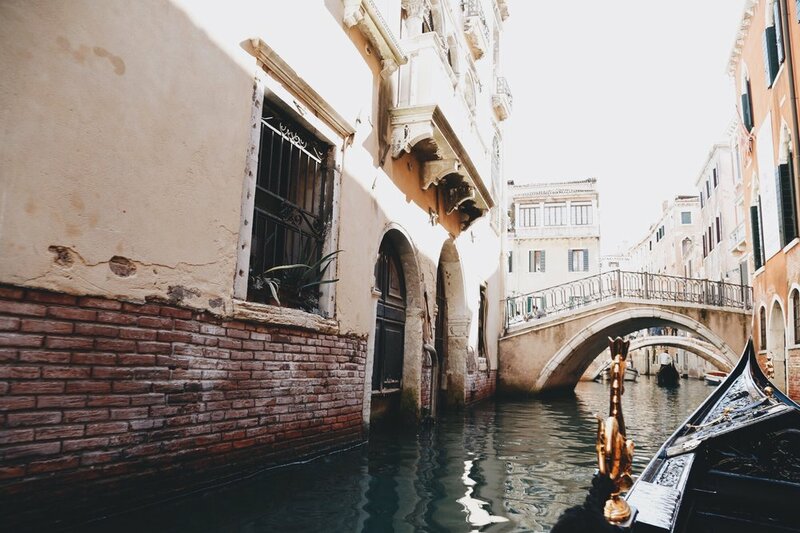 Arriving in Venice was like entering into a secluded and untouched place from the past. 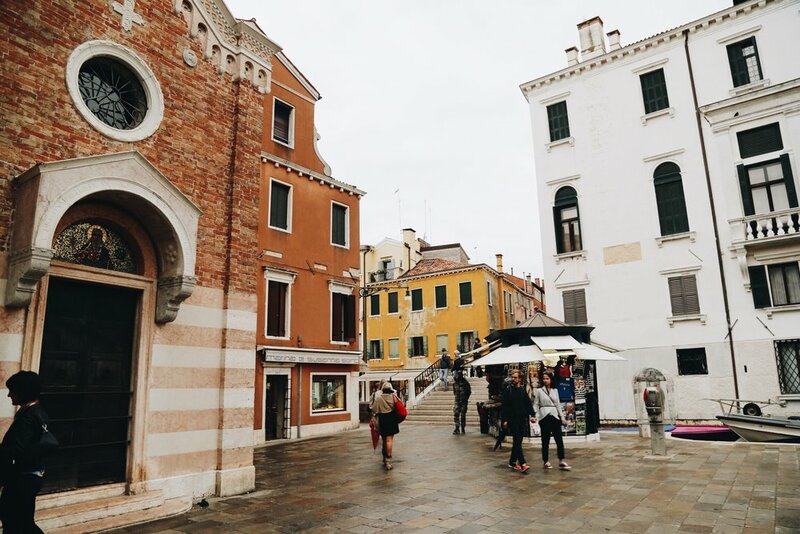 Even though I had an idea of what to expect, Venice was more fantasy-like than I imagined. Rewind to just before boarding the plane in Rome, Brooke and I came to the unsettling realization, that in the midst of all the other planning, I forgot to set up transportation to the hotel. Normally I love a challenge, but arriving in Venice without a faint idea of how to get to your destination, wouldn't be fun. I tried to breathe in-and-out as I frantically emailed the hotel. Luckily they quickly got back to us with our options. Instead of having to figure out four modes of transportation just to find our way to the hotel… we decided to pay up for all the necessary assistance. Upon arrival a man greeted us, drove us right to a water taxi and threw our luggage in, then we were dropped off in front of our hotel like one big magic trick. 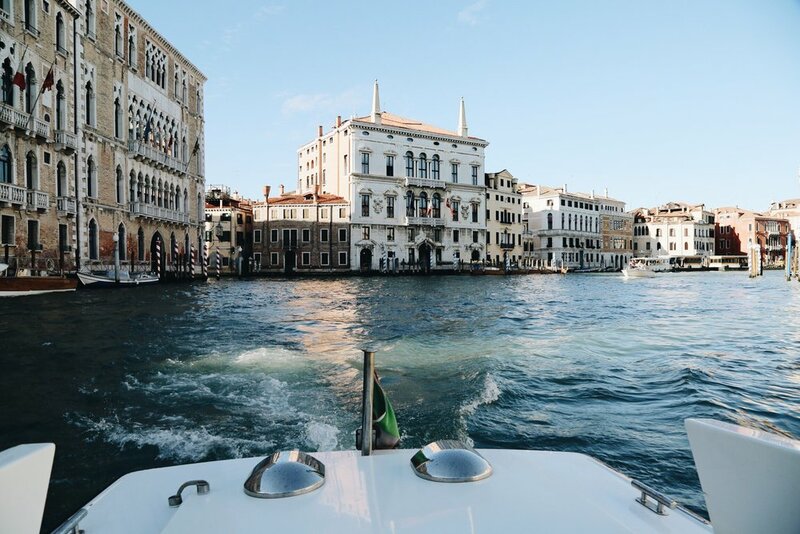 The best part about the surprisingly seamless undertaking was that it included a mesmerizing welcome ride down the Grand Canal. Arriving at the Centurion Palace Hotel was otherworldly. One of the many perks of off-season travel is when you're upgraded to a room with the best view in the house. 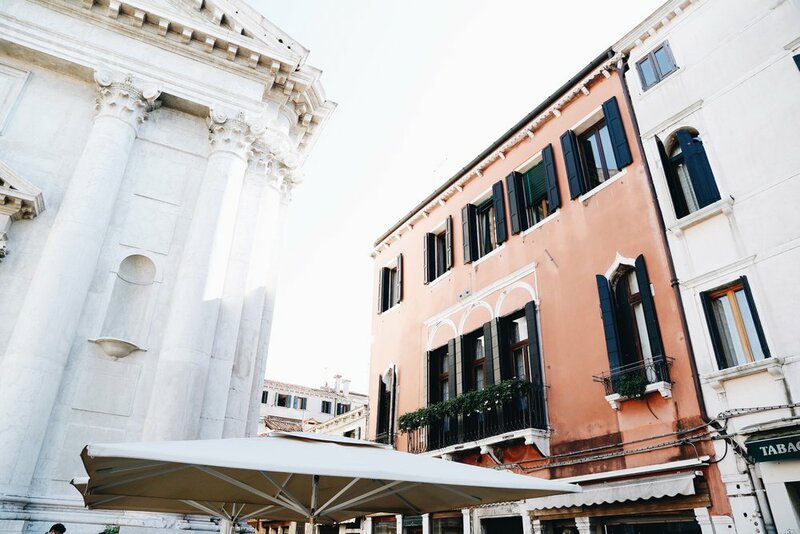 The two mini balconies with 180-degree views of the entire Grand Canal and huge windows opened up to the Basilica di Santa Maria della Salute. The room was accented in burnt orange; from the detailed walls and the decorative plush headboard to the velvet couch at the foot of the bed. Accompanied by the massive fireplace that led all the way up the wall to the ornate ceiling that was seemingly more fit for a museum than a hotel room. The expansive bathroom opened with a bathtub and was entirely wrapped in gold foil, with gold walls and a gold shower.... and all of this was perfectly ok with us ! Aperitif in the hotel’s lounge was a perfect way to end the day while we enjoyed the setting sun. We snacked on savory cookies and nuts and sipped our drink of choice, Aperol Spritz – prepared with Prosecco and a dash of Aperol; a bitter liqueur with hints of bittersweet orange and herbs. Night casts a haunting spell over Venice that is hard to put into words. As we stood on our balcony we felt something eerie in the air. Prompting the need to do some research on a place we knew nothing about, we learned the building just a couple doors down from our hotel had an interesting past. Cá Dario, informally called 'The House of No Return' is believed to ruin or kill all of its owners. More than ten people involved with the home, died in mysterious circumstances, a fate that began in the fifteenth century. The house is currently up for sale, for the daring. Later we made it to La Caravella for dinner, after experiencing the biggest tourist trap of them all, spending forty euros to get across the two-hundred-foot distance of the Grand Canal by boat. We were seated under strung lights and received a local white fish carpaccio palate cleanser compliments of the chef, followed by a special selection of local seafood, prepared raw and cooked, as well as risotto with lobster and fennel sauce. The following day, we left our hotel in the Dorsoduro district to explore the city. Stopping first at an adorable corner café, Bar Da Gino, for a snack of prosciutto and melon. 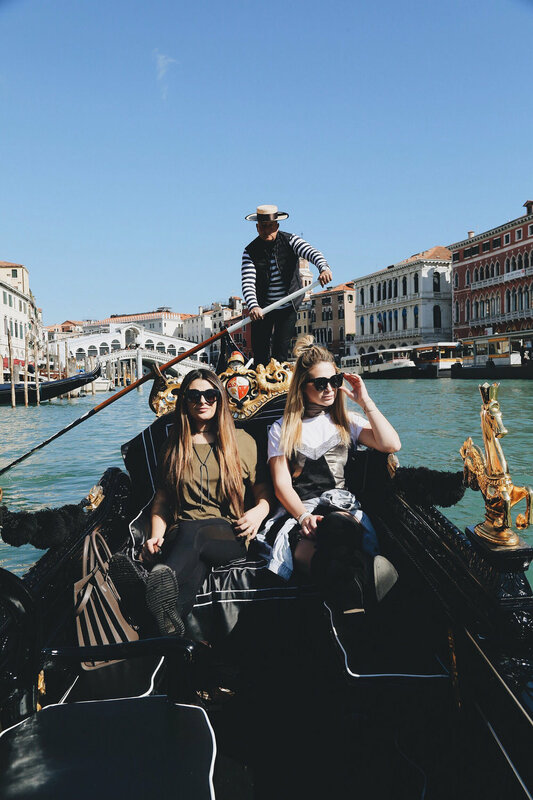 We headed to Ponte dell’Accademia, a bridge connected to San Marco, for the best vantage point where you can see miles up the Grand Canal in both directions. To see the ancient Venetian churches and other buildings with impressive Gothic style, in real life, gave me a whole new appreciation for architecture. The compact streets and corners with eroding walls exposed beautiful layers of history. 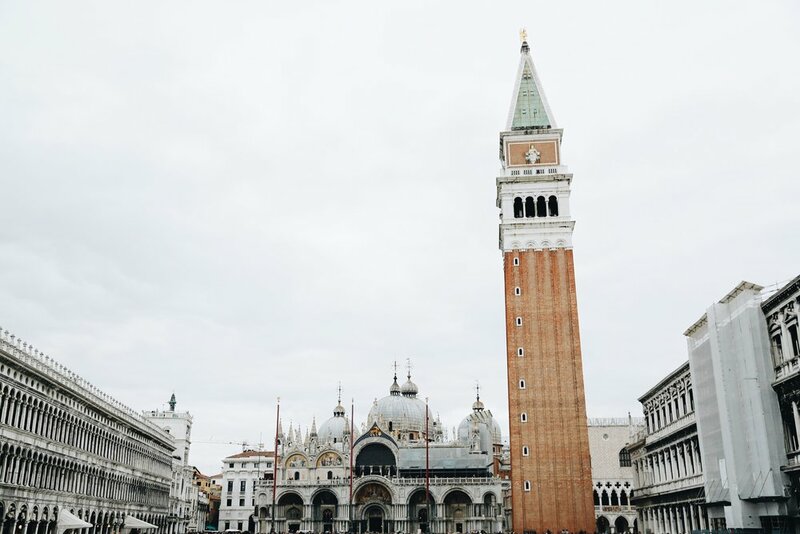 Next, we found ourselves at Piazza Marco, a public square built in the early sixteenth century, made up of the Campanile di San Marco, an imposing cathedral tower, the Basilica di Marco and the Palazzo Ducale. 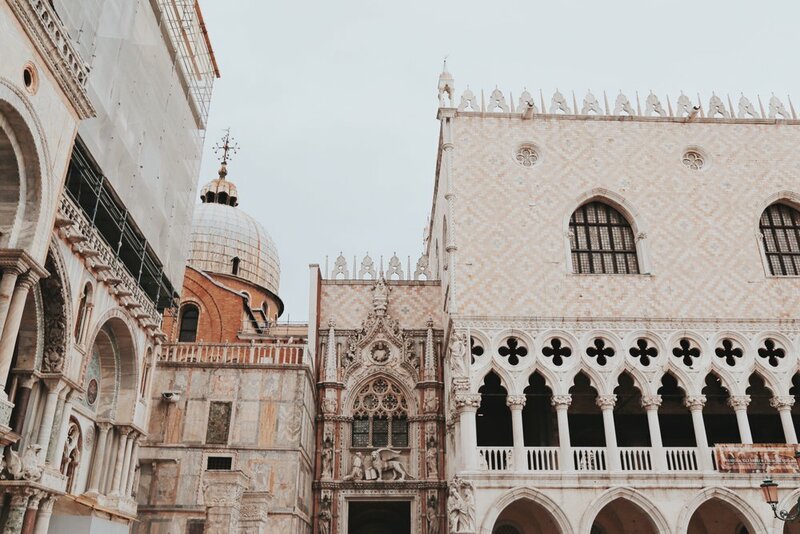 Palazzo Ducale is a palace known to be the symbol of Venice and has to be one of the most beautiful structure's I’ve seen on my travels so far. I was completely captivated with the exterior, incorporating stonework of pink and white decoratively cut marble to create the unique façade. From there we began our way towards the Ponte di Rialto, the oldest, most well-known bridge dividing the districts of San Marco and San Polo. 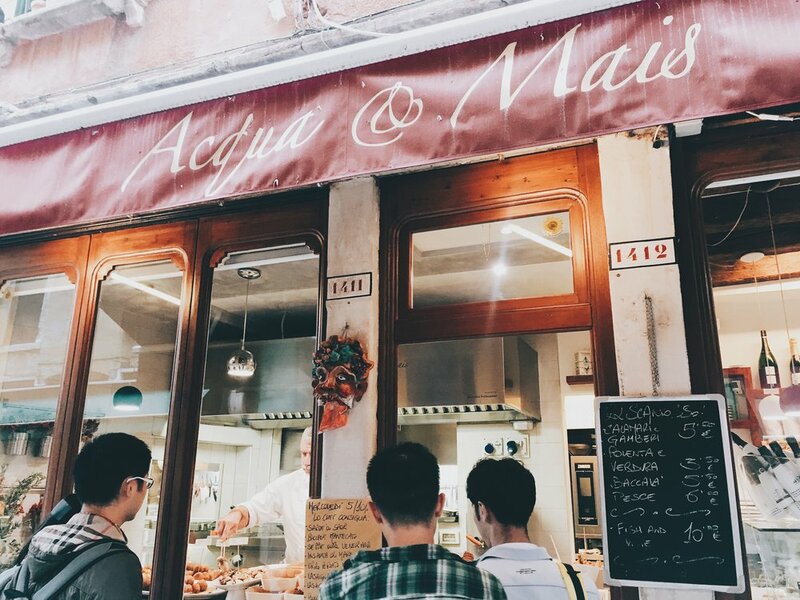 Lined with storefronts and restaurants on both sides of the Canal, we chatted over mussels, pizza, and squid ink pasta. After crossing into San Polo on our way back, an obscure food vendor caught my attention with its impossible-to-ignore aromas. A scavenger hunt took place the next day after dreaming about my love at first sight experience. In doing so we spent some time in Campo San Polo, an enormous square with countless outdoor cafés, exceptional people watching and live music. Just past Campo San Polo, I spotted Acqua e Mais. The men behind the tiny glass enclosed shop were selling the Venetian street food that had kept me up all night. We ordered a huge square of homemade lasagna and a cone overflowing with fried shrimp, calamari and fried fish piled on top of cheesy polenta. 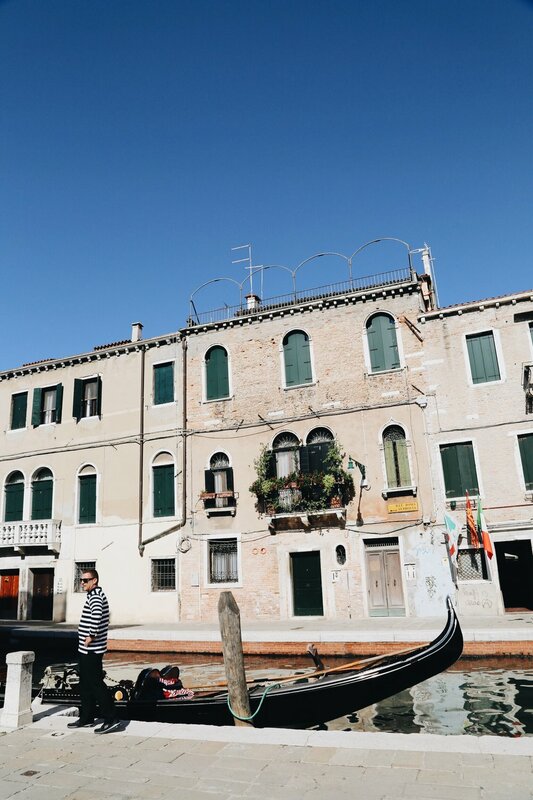 Following the most memorable bites of food in Venice, we took a gondola back to the hotel. 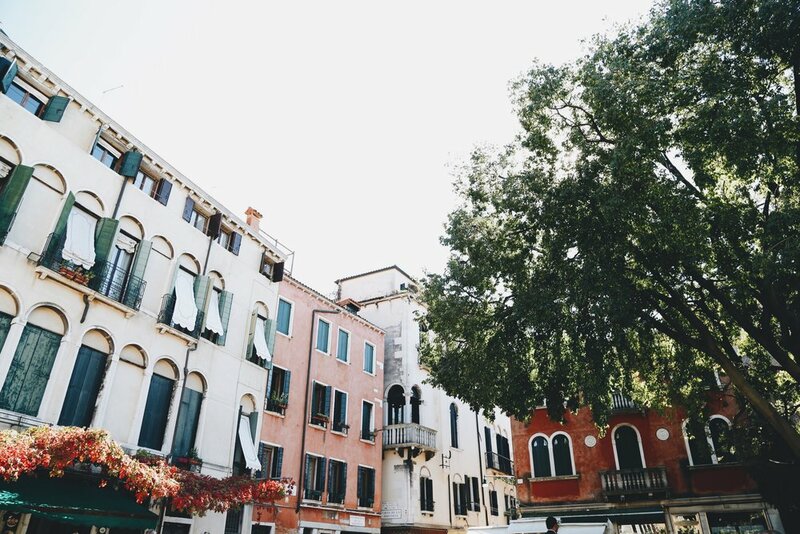 A trip to Venice wouldn’t be the same without it, offering a different perspective of the city with the ability to pass under archways and through the narrow corridors of this enchanting city. 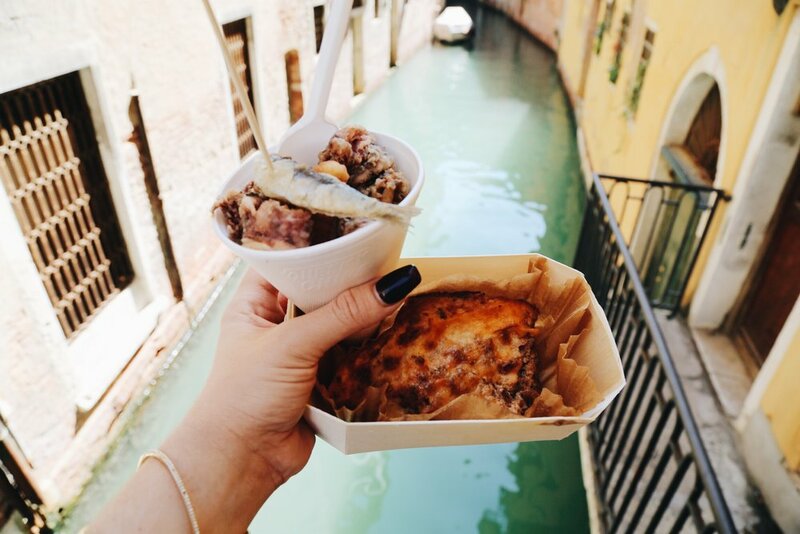 A trip down the Grand Canal in a Gondola, The View from Campanile, The inside of a Venetian Gothic Church, The Corner Pub, Café Florian - the oldest coffeehouse in the world but don’t underestimate their food.